Pest description and crop damage Several species of spider mite are common in the Pacific Northwest. Frequently, infestations include a mixture of spider mite species. Adult mites are about 0.06 inch long, have four pair of legs, are greenish to pink or cream color and have various-size black spots on the body. 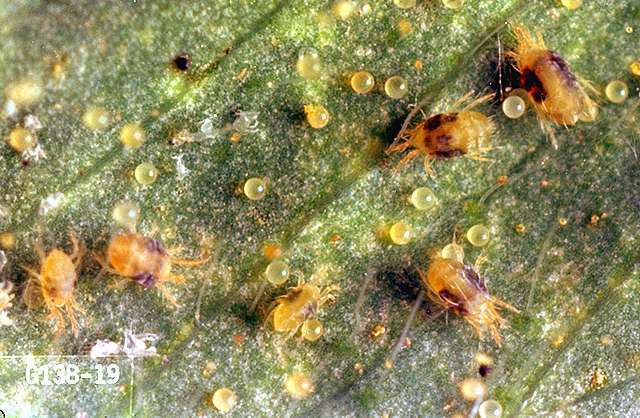 Under warm conditions, spider mites move rapidly within the colony area. Damaged leaves become somewhat stippled on the upper surface and may turn brown or bronze with heavy damage. The undersurface of leaves may have a grayish cast due to webbing. Wilting, leaf deformity, tissue death, and abscission all may take place. insecticidal soap-Apply control measures when mites first appear and repeat application as necessary. Complete coverage, especially under leaves, is essential. Some formulations are OMRI-listed for organic use. plant-derived essential oils (such as clove or rosemary)-These have some efficacy against spider mites. Some formulations are OMRI-listed for organic use. abamectin (Agri-Mek) at 0.009 to 0.019 lb ai/a. PHI 7 days. REI 12 hr. Do not make more than two sequential applications. Retreatment interval 7 days. Do not exceed 0.056 lb ai/a per season. bifenthrin/avermectin (Athena) at 0.092 to 0.12 lb ai/a. PHI 7 days. REI 12 hr. Retreatment interval 7 days. Do not exceed 0.056 lb ai/a avermectin or 0.3 lb ai/a bifenthrin per season. bifenthrin/zeta-cypermethrin (Hero) at 0.1 lb ai/a. PHI 3 days. REI 12 hr. Retreatment interval 7 days. Do not exceed 0.4 lb ai/a per season. bifenazate (Acramite 50W) at 0.375 to 0.5 lb ai/a. PHI 3 days. REI 12 hr. One treatment per season only. bifenthrin (Brigade WSB) 0.08 to 0.1 lb ai/a. PHI 3 days. REI 12 hr. Retreatment interval 7 days. Do not exceed 0.3 lb ai/a per season. etoxazole (Zeal) at 0.09 to 0.135 lb ai/a. PHI 7 days. REI 12 hr. Do not exceed 1 treatments per season. fenpropathrin (Danitol) at 0.2 to 0.3 lb ai/a. PHI 7 days. REI 24 hr. Do not exceed 0.8 lb ai/a per season. insecticidal soap (M-Pede) at 2% solution. See label for gal/a. PHI 0 days. REI 12 hr. Some formulations OMRI-listed for organic use. naled (Dibrom 8) at 0.94 to 1.9 lb ai/a. PHI 1 day. REI 48 hr. Retreatment interval 7 days. Limit 5 treatments per year. Do not exceed 5.6 lb ai/a per season. Summer squash only. propylene glycol monolaurate (Acaritouch) at 12 to 25 oz/100 gal of formulated product. PHI 1 day. REI 4 hr. spiromesifen (Oberon 2SC) at 0.11 to 0.13 lb ai/a PHI 7 days. REI 12 hr. Retreatment interval 7 days. Do not exceed 0.4 lb ai/a per season. oxydemeton-methyl (MSR Spray Concentrate) at 0.375 to 0.5 lb ai/a. PHI 14 days. REI 14 days. Do not exceed 1 application per season.